Moving? Let’s be honest; moving is stressful. But, imagine if you can’t read, understand all of the chatter around you and all you see is the chaos of boxes, your home in an upheaval and stressed out humans everywhere. Sounds even more stressful, right? 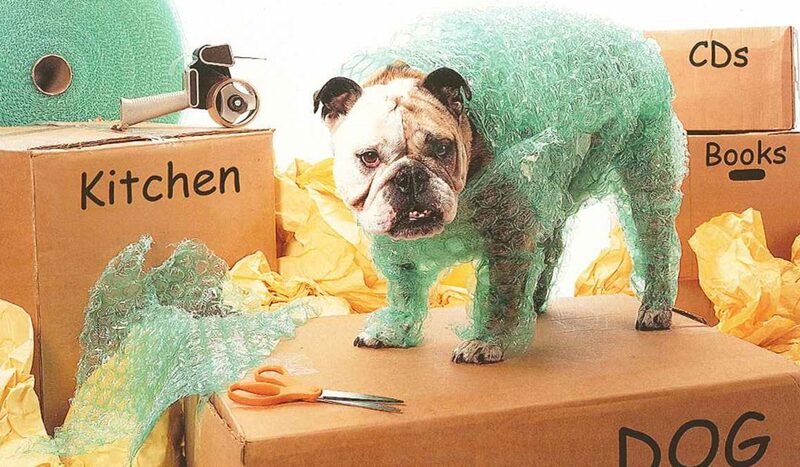 That’s why it is vital to look after your pets during the moving process. Landlords and homeowners’ associations may have specific pet rules. Your pet may need additional vaccinations, medications or certain certificates depending on where you are moving. A call to the local animal control facility should answer your questions. Your veterinarian is a great resource. If you have an animal that dislikes traveling, your vet can suggest behavior modification techniques or medication that can make traveling less stressful for your pet. When talking to your vet, also discuss micro-chipping. Find a new veterinarian in your new area before moving day. Your current vet may be able to make recommendations for colleagues he or she knows in your new area. When finding a new vet, it is recommended to set up an appointment as soon as you move in order to get established. Instead of pulling an all-nighter to pack, try to pack over a long period of time so that your pet thinks everything is normal. This will keep their stress level down. If you are moving with cats, it can help to bring out their carriers out a few a weeks before the move. Don’t pack the food away! Keep your pet’s food, water, bowls, medication and any other important supplies (like that favorite squeaky toy) off the moving truck and with you. Unless your move is long distance or international, your pet will likely be traveling by car with you nearby. By driving them yourself, you can care for them and give them a sense of familiarity as they move. To prepare your pet for this trip, drive for short distances with your pet to prepare them before the final move. Also, remember to plan ahead for any special carriers your pets may need for transportation. There are even special seat belts for large dogs. Take them out on a leash to explore their new territory and show them how to get home. If you let them out in a new place right away, they might get lost or run away due to stress. Make sure your pet’s new identification tags are secured to their collar. Keep your pet away from all the action to ensure their safety. Keep them in one quiet area or safe in their kennel while keeping a regular watch on them. Prepare a little care kit that has enough food, toys and/ or grooming tools to keep your pet comfortable during the first few days of unpacking. Take your pet along with you while you travel to your new home. Cats and dogs can be put in a carrier in the back seat secured with a seat belt. Unpack and set up before you introduce your pet to the new house, and have them slowly adjust to their surroundings. Give your pet a lot of attention and introduce familiar objects to ensure comfort. If your looking to learn more about prices for Residential Movers feel free to contact us!